At the largest conferences on the Model United Nations circuit, the glitzy committees, fast-paced debate, and lavish conference rooms often allow delegates to forget about the dozens of people behind the scenes who make these events possible. At Harvard National Model United Nations 2015, more than 230 hard-working individuals have come together for this weekend to ensure that the renowned conference is deemed a success. Regrettably, the drive and dedication of most of these students will go unnoticed; the long hours that their noble jobs entail prevent most of them from receiving the credit that they deserve. Agence France-Presse dove into their chaotic and exciting world in the hopes of shedding a small bit of light on their daily routines and conveying our collective gratitude for all that they do. Avi Saraf surrounded by his HNMUN merchandise. Avi Saraf is not stranger to the world of Model United Nations. 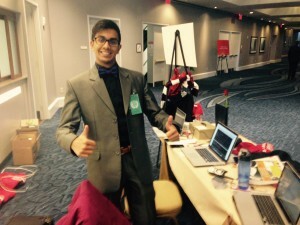 In addition to his work for Harvard National Model United Nations 2015, Saraf is a member of the Harvard University competitive traveling Model UN team where he has competed (and won!) in conferences at Columbia University and the University of Pennsylvania, among others. At HNMUN 2015, however, his role is much more technical. Saraf is responsible for many of the most critical business endeavors that support the committees and keep the conference solvent. “The business side of HNMUN does everything from designing the merchandise to running social events,” Saraf explained to Agence France-Presse. “In fact, we run every social event with the exception of the delegate dance,” he noted. 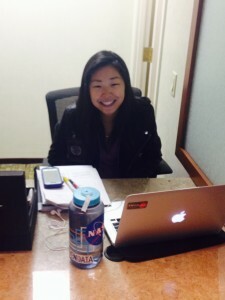 Cindy Zhao in between financial accounting sessions. Zhao went on to explain many of the intricacies of her job. The finance team collects any and all fees from delegates — think lost placards and badge replacements, conference dues, and school registration requests. Moreover, they help with the details of the overall budget of HNMUN 2015, likely in the hundreds of thousands of dollars judging by the budgets of similar conferences like the University of Pennsylvania Model United Nations Conference in Philadelphia, Pennsylvania. Charlene Hong in her HNMUN habitat. Hailing from Nashville, Tennessee, Charlene Hong quickly demonstrated to Agence France-Presse why she fits perfectly into her role on the Admin team of HNMUN 2015. “I love to deal with people,” she quickly revealed, and her position allows her to interact with delegates from approximately 75 different countries every day. Hong staffs the Delegate Relations desk for hours each day where she is in large part hounded with requests from frazzled students. In between answering our reporter’s questions, she directed two lost faculty advisors to their meeting, fielded several badge replacement requests, searched for room information for a non-native speaker of English delegate, and refilled her cup of coffee. Hong admitted that, like many of the other non-staffing departments of HNMUN 2015, the Admin team is incredibly close. “We call ourselves the Ad-pound-pound-min team,” she laughed, banging on her desk twice in a row to convey the onomatopoeia inherent in her Model UN family’s name. Agence France-Presse was captivated by Hong’s ease when discussing how Model UN fits into the rest of her life. 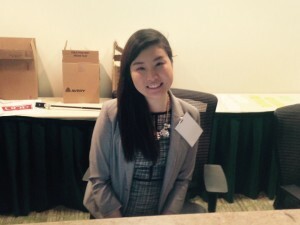 “I was intrigued by the idea of running a conference,” she began, “and seeing how managing it and all of its logistics would work.” She noted that the skills one gains from working a conference like HNMUN translate well into many post-graduate fields. Between the document requests, diplomatic fielding of questions, prop delivery, and other minor logistics that comprise every hour on the job for her, our reporters have little doubt that she is entirely correct.